I venerate thee, great queen, and I thank thee for the many graces thou has bestowed upon me even unto this day; in particular for having delivered me from the hell which I have so often deserved by my sins. I love thee, most dear Lady; and for the love I bear thee, I promise to serve thee willingly forever and to do what I can to make thee loved by others also. 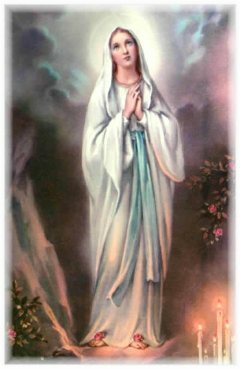 I place in thee all my hopes for salvation; accept me as thy servant and shelter me under thy mantle, thou who art the Mother of mercy. And since thou art so powerful with God, deliver me from all temptations, or at least obtain for me the strength to overcome them until death. From thee I implore a true love for Jesus Christ. Through thee I hope to die a holy death. My dear Mother, by the love thou bearest to Almighty God, I pray thee to assist me always, but most of all at the last moment of my life. Forsake me not then, until thou shalt see me safe in heaven, there to bless thee and sing of thy mercies through all eternity. Such is my hope.